EMILIO BRATTESANI was the son of Lorenzo Brattesani and Christine Delonge. Lorenzo was born in Italy in June 1845 . 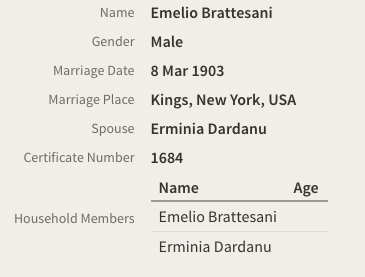 He married Christine Delonge in Italy in 1869 before leaving for New York in 1871, one of the first Brattesani family members to emigrate to America. We find Emil in Brooklyn, New York age 36 years, described as a chauffeur in a Trucking Company. His date of naturalisation was 1903. With him his wife Minnie age 35 and their children. This census was fascinating to show not only where they were born, date of naturalisation, but also mother tongue. By 1930 the family had moved to 37th Avenue and this census shows us that they now owned their home and that he was still working as a Trucker.